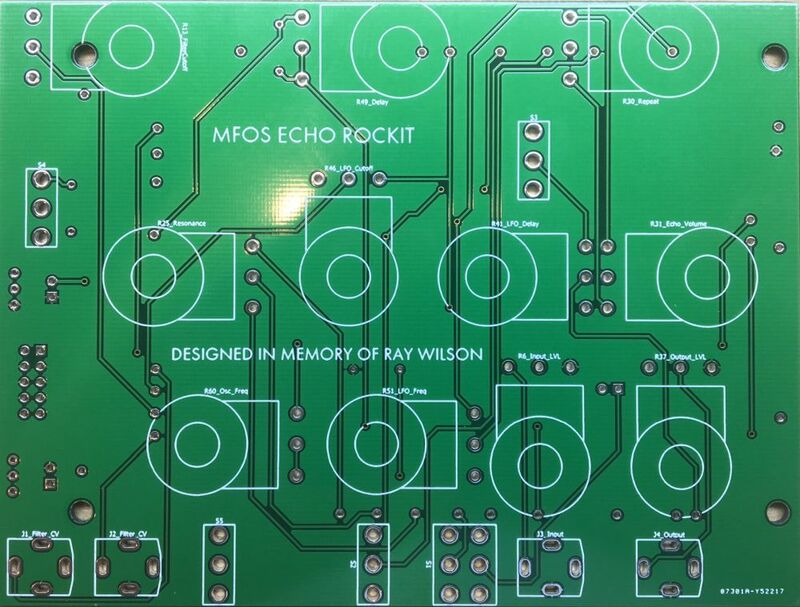 With gratitude to clarke68 for the panel design and barcode for the panel pcb layout, we're happy to announce the MFOS Echo Rockit for eurorack. 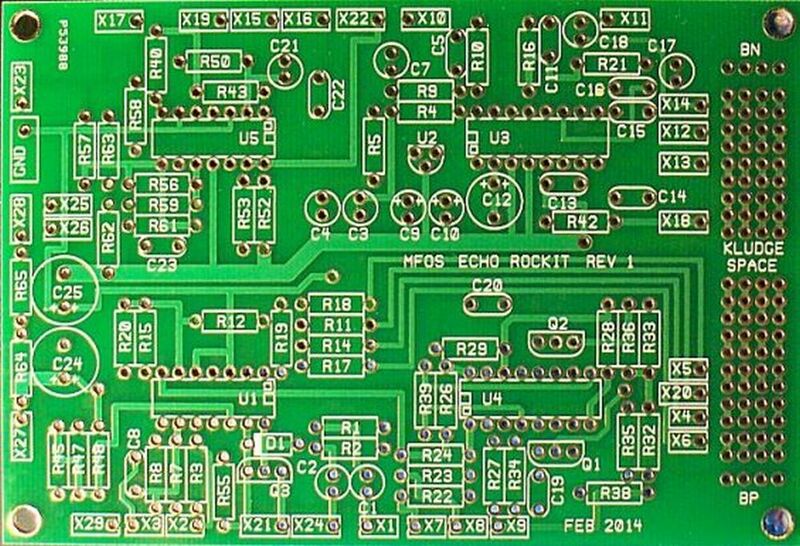 Shortly, we'll be offering panels, panel+pcb sets, full kits and assembled units for the PT2399-based echo. Pots, jacks and switches mount to the panel PCB- no wiring! We'll post the BOM, schematics etc shortly. The original MFOS through-hole PCB layout is utilized in combination with the barcode panel pcb. definitely interested in this! would love cv control over delay time though. Should be a fairly simple mod? Something for the kludge space? But does it work with modular levels? The original runs on a single 9V battery, right? Grounding issues will arise if the Echo Rockit is powered from one side of a dual supply system. 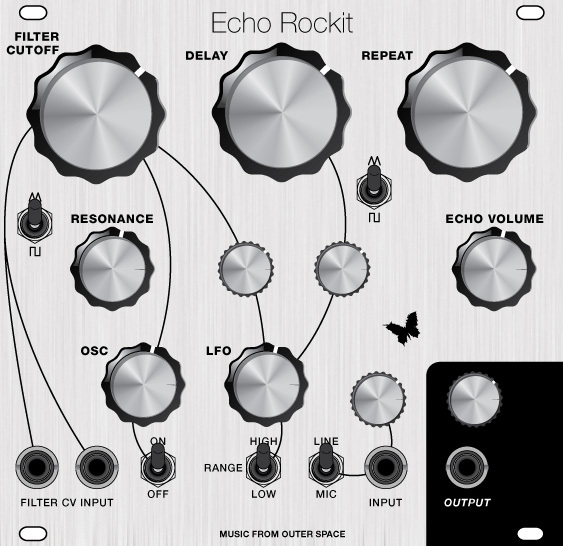 The Echo Rockit's virtual ground will be at 1/2 of the positive supply which will make DC ground matching impossible. I think issues involving smoking ICs could arise if this advice is ignored. If you know of something I don't on this issue I'd be happy to hear it but I highly recommend the solution shown above in the "Powering an Echo Rockit from Your Dual Supply" illustration. I see that the 78L05/79L05 has been included in the BOM. So I guess the suggested solution has been implemented (hard to see on the pcb). Does it work well in a modular context? Any problem if the filter CV is like close to +12V or -12V? 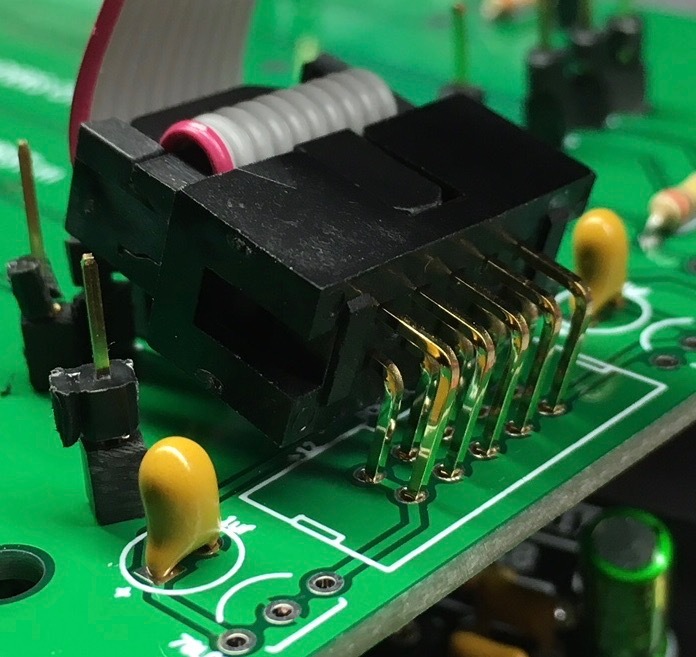 yes, it was designed to incorporate the MFOS circuitry for use on +/-12V euro systems... we're biased of course but love the couple of them we have set up here. Do you happen to know if there is any problem when the input exceeds the 10V (as I understand, with the modification the Rockit essentially runs on +/-5V, so it should have a bit less headroom than the "usual" eurorack). I just want to make sure I can use it in a system without any thinking. Just started building my kit! Another wonderful kit by synthcube thanks so much! Looking forward to more MFOS in my rig. How are the PCBS connected? should the component pcb connect with the pins to the hardware pcb through the X pads? 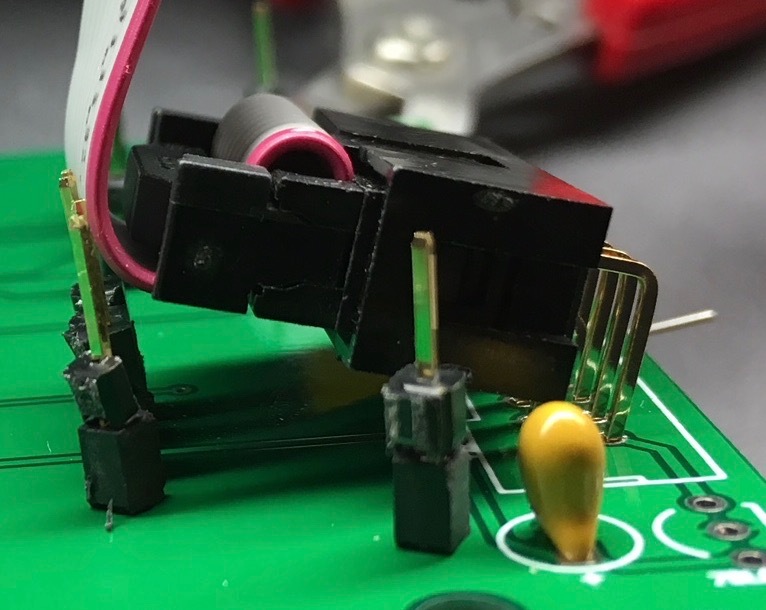 correct--- the single pin pads on the main PCB (that are used for flying wire connections for the original panel) connect via pin headers and female sockets to the panel PCB-- enjoy! worried about the orientation of the square headers, should I use circular machine headers for a better fit? Also missing the nuts to secure the back of the standoffs from the kit! we've had good reports from builders using the square ones, but no issue changing them-- and drop us an email we'll send the nuts!! Thanks! now also started building (from pcb/panel). One question: which jacks are needed? Is it the PJ301BM (e.g. from thonk) and what is the orientation? The seem to fit only one way ... but not in the way indicated on the silkscreen. AND: the switches are all on-on, correct? Some other comments: the single pins are a major pain. Not sure if the panel is really that much of an advantage versus wiring (or a panel plus panel pcb that is the connected via wires to the main pcb). The holes for the switches are quite tight and won't work with the (more common) switches that have a solder lug. I was just about to start building one today. I've been eyeing the box of parts for days longingly. :) As with the other 2 MFOS I've built, there was a lug on the pots that had to be cut off. Is that what you're referring to? If so, it's plier time. I've worked through most of the confusions myself, with regards to the panel with the pots. I wish the resistors and caps were as clearly documented on this panel as they are on all other MFOS boards that I've put together. I can't actually see if the 78L05 voltage regulator slot is what it says. So blurry it could be 79L05, though i guessed. My BIG QUESTION is about the instructions "mount all headers on this side" and Mount All headers first". What headers? Male or female. And what about the other pins. HOw is this supposed to go together? on other MFOS devices I just used hookup wire. Ok, should i put the female headers in x1-x28? And also ground and also BN & BP. Instructions would really help, but I seem to have some of it figured out. Any thoughts? THanks in advance. 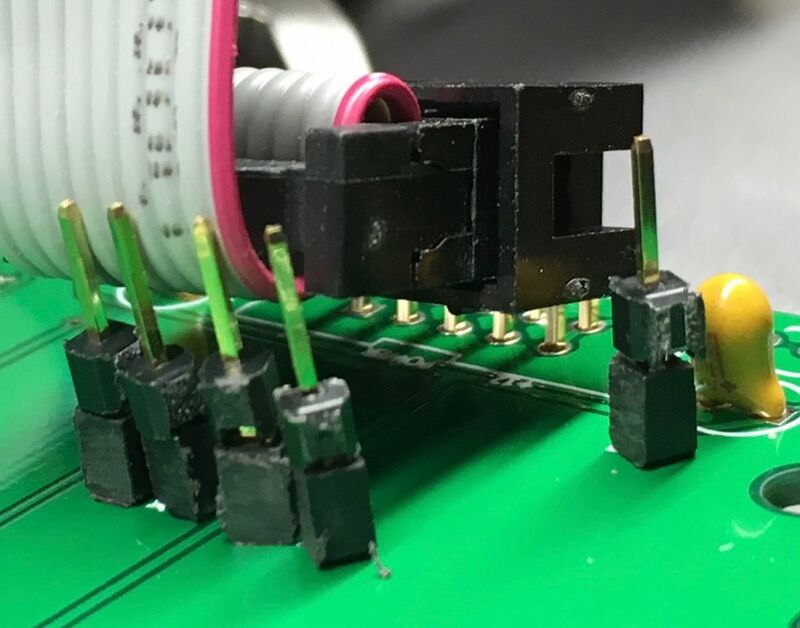 the single pin headers can be installed either way-- female on one board, male on the other-- just make sure you use the same 'gender' on one pcb- no mixing and matching! Yes, I get that.I have designed my own boards. I was perhaps being a big oblique. I'll be less so. How come there are no instructions with this board? The thing I liked about Ray's work was the amazing and often hilarious instructions. There were pretty good instructions with the pre-eurorack version, but nothing here. I have no trouble just guessing and using common sense, but that does mitigate the joy of MFOS, don't you think? Let your fans do it... if you had a little wiki somewhere, people would just write all the bits they figured out and you could just package it up. I know I'd help just for fun. I still don't understand why I'm soldering on pin headers though. Is there something I don't understand as to why I'd do this and not just solder it all together like on my noise toaster and WSG? Serious question. I'm not that experienced, and I'm worried that there's something I don't understand about why one way is better than another. The single pin headers directly join the two boards together. That's craziness. I doubt I'll ever get all the pins aligned, but that's another issue. My big question is why are C6 & 2xPWR caps diagramed as polarized, yet they're non-polarized caps? This scares and confuses me. Am I doing something wrong? Right. Sorry. I was working from memory the 2xpwr were obvious. But why on the circuit board is C6 shown as polarized with a circle with a + next to it. Scares us noobs. FINAL question: how can I orient the power and connect the ribbon and get around the pins x4, 5, 6, 20? See below. I'm so close to done, and not quite sure if I did it right. Thanks!